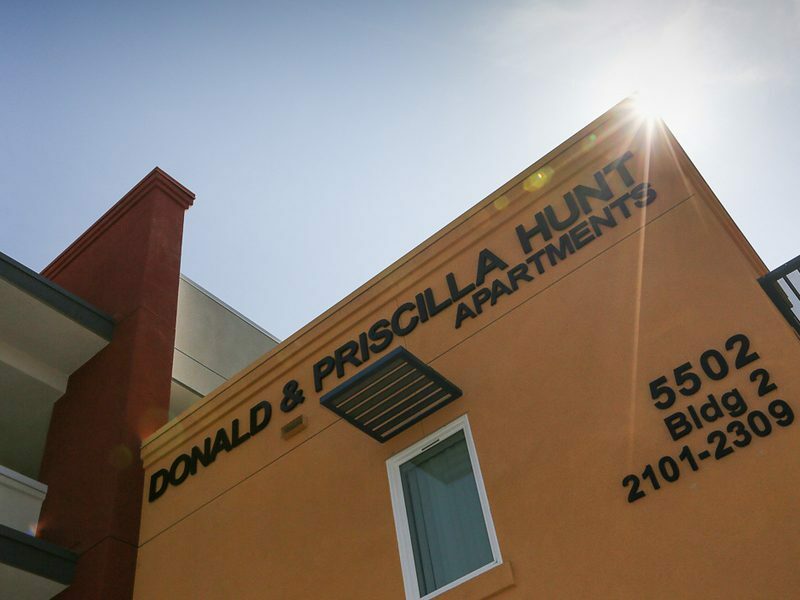 If ‘home is where the heart is,’ then it’s fair to say the residents of the new Donald and Priscilla Hunt Apartments at Bell Oasis in Bell, California, are surrounded by more love than ever. The Donald and Priscilla Hunt Apartments at Bell Oasis—which officially opened in September 2018— is a forward-looking rapid re-housing project with 64 affordable housing units, including 43 reserved for veterans, and marks a significant expansion of the Bell Shelter grounds, one of the largest homeless shelters in the western United States. What is the Bell Shelter? The Salvation Army Bell Shelter operates a comprehensive program that offers interim housing with supportive services for up to 500 single men and women who are experiencing homelessness. The primary goals are to meet the emergency needs of clients and to address the underlying issues that contributed to their homeless condition by supporting their achievement of a higher quality of life through greater self-reliance, increased income and increased housing stability. The newly opened Donald and Priscilla Hunt Apartments at Bell Oasis provide 64 units of permanent supportive housing for individuals with disabilities who were formerly homeless. Nearly 50 of the units are already occupied by residents, some of whom have been chronically homeless for 20 years—and more than half of them were referred directly from the shelter next door. In fact, he’s even found love, too. Follansbee is looking forward to the new garden plots that will be installed as part of The Home Depot Foundation’s $400,000 grant initiative, which helped fund the completion of the complex, along with donations from the Hunt family and other corporate partners. His fiance, Cindy, started crying tears of happiness when pots and pans, linens and other household items were brought in thanks to a partnership with the nonprofit organization, Brilliant Corners. Monthly house meetings, weekly lunches and opportunities to bring family and visitors over have all added to shared feelings of joy. Soon, they’ll be getting new microwaves and toaster ovens. The pair and other residents will also be able to partake in services and activities at GrowGood, the urban farm next door that helps provide fresh produce and job training for the homeless and the community. Garcia said that GrowGood will be providing a cooking class for residents once or twice a month to teach them the basics of how to use items from the garden or pantry to make healthy, delicious meals. For veterans, an on-site case manager and peer specialist are both available to help facilitate activities and support. About five to 10 residents are already meeting weekly for exercise together on Wednesdays. For those who are ready to be moved from transitional housing to permanent—people who are stable, with steady income, either from work or veteran or disability benefits—Bell Oasis can be a place to call home for life if they so choose. Best of all, Wager said, they’ve been staffing up so that residents at both the shelter and the Bell Oasis apartments will be able to utilize services across the street at the larger Bell Shelter campus, such as rehabilitation, veteran services, case management and the chapel. Steve Lytle, Director of the Bell Shelter, is particularly excited about the forthcoming on-site health clinic, which will open soon. In partnership with John Wesley Hospitals, the clinic will feature two exam rooms and a waiting room where residents at Bell Oasis can receive care. It’s a crucial part of the transition process, said Garcia, because mental health and physical health needs have often gone by the wayside, particularly for those who have been chronically homeless. Part of the overall commitment to wellness at Bell Shelter and Bell Oasis can be seen in its location and upkeep: the facility and its staff strive to maintain a tranquil place out of the way for those with PTSD and other disabilities to heal and have peace, said Lytle. And while the Los Angeles Times recently covered the controversy surrounding the city of Bell and its plans to allow a cement company, Cemex, to open up a disruptive new gravel yard next door, he, Wager, and their staff are devoted to fighting back. The Salvation Army opposes the city’s plans, which would see hundreds of gravel trucks driving between the Bell Shelter and the new apartment complex on a daily basis on K Street, a usually quiet, two-lane street. “It’s just a question of time before someone gets hurt or worse,” Lytle said, while Wager noted several residents are wheelchair-bound or have disabilities, and that their concerns extend to their staff as well. As for Garcia, he knows this is just the beginning of a new life for many residents fighting their own battles. When someone says the phrase, “you saved my life” to Priscilla Hunt, it’s a safe bet they mean it literally. Hunt and her late husband, Donald, have been helping those in need in Southern California through their philanthropy for years. Born in the Philippines, Priscilla immigrated to the United States at the age of 21. Today, she serves as president and chief executive of Hunt Enterprises, a real estate company that develops and manages more than 4,000 rentals at high-quality residential communities, including commercial and industrial facilities throughout Southern California. Empathetic and compassionate for others by nature, it was from Donald that she first learned of The Salvation Army. His father was a Salvation Army officer, and his mother was a fundraiser. Hunt said Donald started as a dishwasher, but was quickly promoted to have an opportunity to work in the candy store at camp. By the time he was a teenager, Donald was already a budding entrepreneur. He took work anywhere he could—delivering newspapers, working as an usher at the opera and delivering ice. But he always made time to give back. He was also in charge of picking up the red kettles at Christmastime to ensure the funds were distributed properly and he played in The Salvation Army band. As for Priscilla, the cause is personal. Having lost a number of family and friends to cancer and other illnesses, she and her husband prioritized health-related giving. They’ve provided support to Torrance Memorial Hospital and the City of Hope, among other facilities. Still, she was particularly moved to help fund what the Army was doing for those in need, the hungry and especially for veterans, she said. For her, helping vets and those who have been chronically homeless to get back on their feet is “the best gift to be given,” both to honor the legacy of her husband’s passion for giving, and to thank those who have served and protected our country. 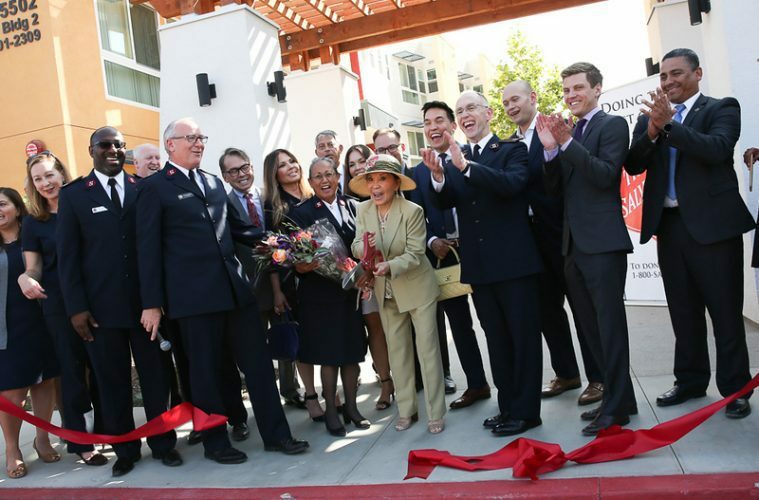 As part of a $7.5 million pledge the Hunts recently made to The Salvation Army, the Donald and Priscilla Hunt Apartments at Bell Oasis in Bell, California, opened in September 2018. The forward-looking, rapid re-housing project features 64 affordable housing units, including 43 reserved for veterans. The Home Depot Foundation’s $400,000 grant initiative helped fund the completion of the complex, along with donations from the Hunt family and other corporate partners. 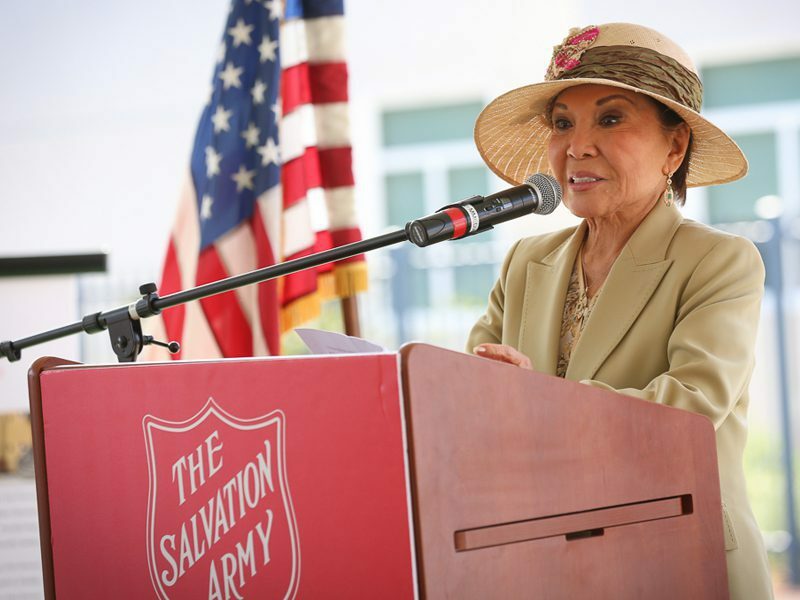 The Hunts’ gift also helped fund the The Salvation Army Long Beach Corps and Community Center, renamed the Donald and Priscilla Hunt Red Shield Community Center. Their ongoing generosity has been crucial to fulfilling the Army’s mission in Southern California, said Bell Shelter Director Steve Lytle. “The Salvation Army cannot do the important work it needs to do without the support of generous donors like Priscilla Hunt and her family, who know and appreciate the importance of helping others who are less fortunate,” he said. And while she does what she can, she knows she can’t do it alone. What can you give? As Priscilla Hunt says, “If we each give what we can, little by little, it will add up.” Give to support The Salvation Army’s efforts in your community.